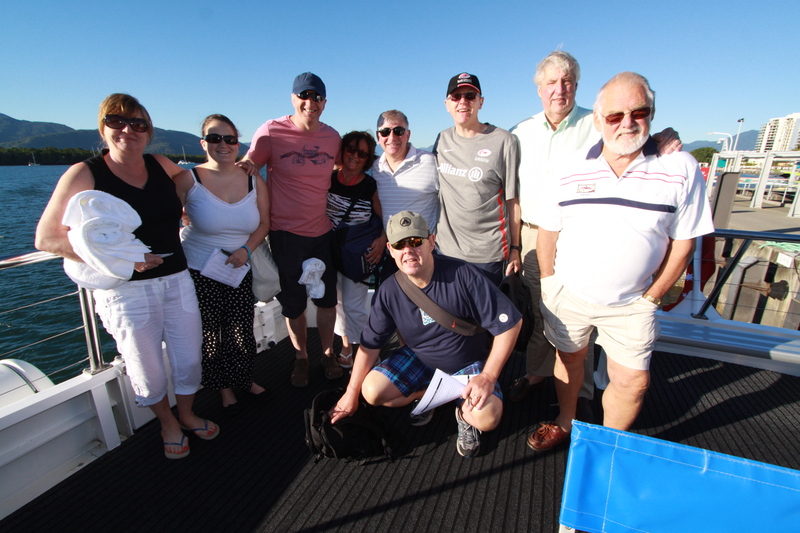 The final Monday saw 10 of us head out on a catamaran style boat to visit the marvel of the Great Barrier Reef. It was a beautifully bright day and we were all incredibly excited about our forthcoming adventure. Me, perhaps a tad too excited about the possibility of seeing Nemo more than anything – it was going to be a massive let down if I didn’t see one! My lot & I ready to find Nemo! The sea out was pretty choppy at times, but thankfully I was ok with it. I had also taken the suggested ginger tablets when I got on the boat which may or may not have been a massive help! It's not a pleasant after taste tho I will warn you if you drink them with coffee!! The way out to the reef took about an hour and a quarter – not too bad in my view, some of the others started to feel somewhat queasy and disappeared for some air. We were on the top level of the boat inside which was fine, apparently it's meant to be less rocky below deck – I beg to differ, the amount of people throwing up down there would have totally done me in! Had I seen, heard or smelt sick I would have been following suit & I'm not sure I'd have actually made it out in time either. 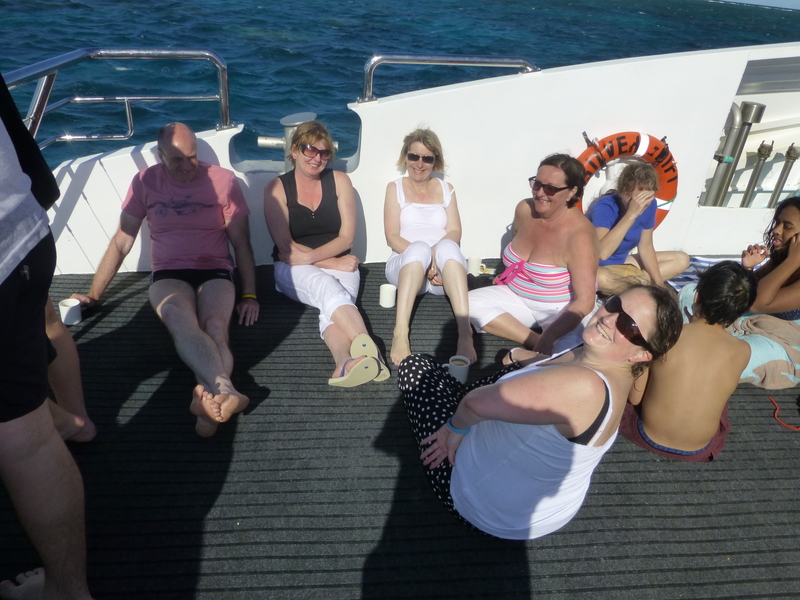 We moored up on the first reef and had been given the instructions on what to do i.e. 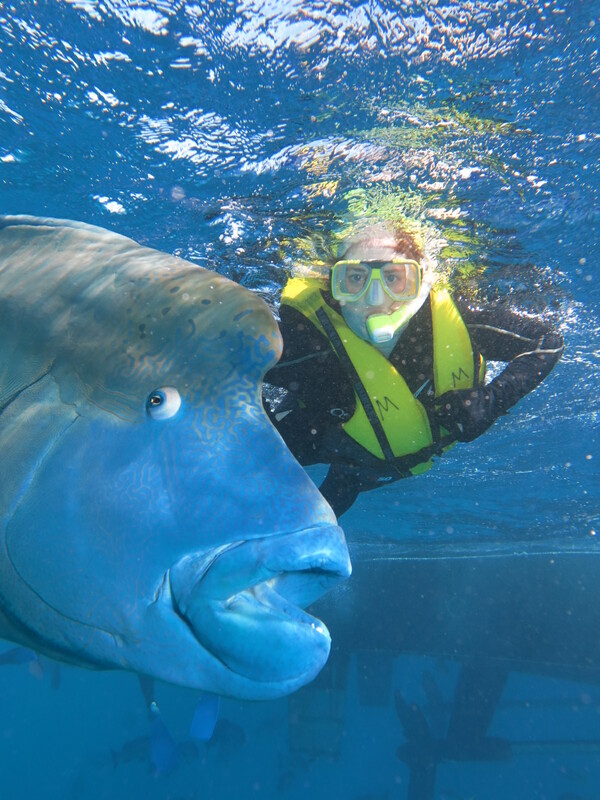 in how to put on your snorkel and flippers and were told that wearing a lycra suit was not a must as its not jellyfish season so we would be very unlikely to be stung. I put one on anyway as I wasn't entirely sure quite how cold the water was going to be – even tho they had told us that it was about 23/24 degrees. Snorkel on flippers on and I was away. I could actually see the bottom and so it didn't feel quiet as bad as when I got scared by the depths out in Egypt. There were loads of quite large fishes out near the boat – I guess that they must have put done food in or something for so many to be there. This particular part of the reef there was a bit that looked like the shape of Micky Mouse's head. I think I got out as far as that – it was easy to spot from the boat but not quite so much when you are bobbing around in the ocean!! There were some beautiful fish swimming around, I scoured the coral to try & find Nemo – we had already been told that one like actual Nemo was very shy and not really all that common. I was buggered if I had come out ALL THIS WAY not to see the little blighter in his own place?!! I think for the first session in the water I was definitely the last of our group out the water. I was having a total ball. The sights to take in underwater were quite something. I was trying so hard to just take the photographs of the experience of seeing this entire new world under the water all in my mind so that I could savour them for years to come. 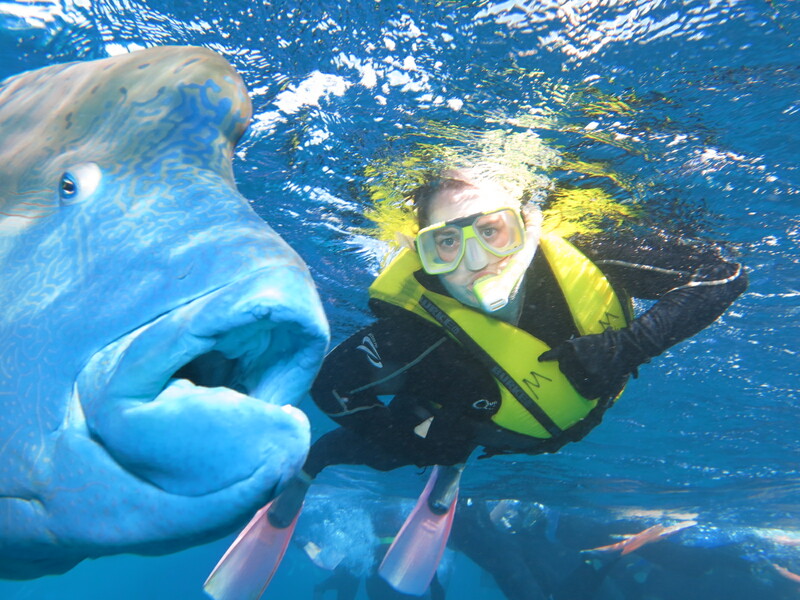 I even managed to get my photo taken with Nigel – this massive fish, I can't remember what he actually was apart from being HUGE! Nigel & I – he looks photoshopped – honestly he isn’t! We had lunch on board which is what looked like THE most amazing seafood (obv not my cuppa cha!!) they had a hot and cold buffet on board and I have to say I was very impressed with the quality – I had some delicious sushi rolls with tuna & cucumber in but no peppers! Needed some form of energy to keep me going to get back in the water for more time trying to find bloody Nemo. As the water was still pretty choppy we didn't actually move to the second reef but stayed moored where our first snorkelling session was. Again I failed to see Nemo, I could tell that I was going to be more than disappointed with the whole trip if I never actually ended up in seeing one. 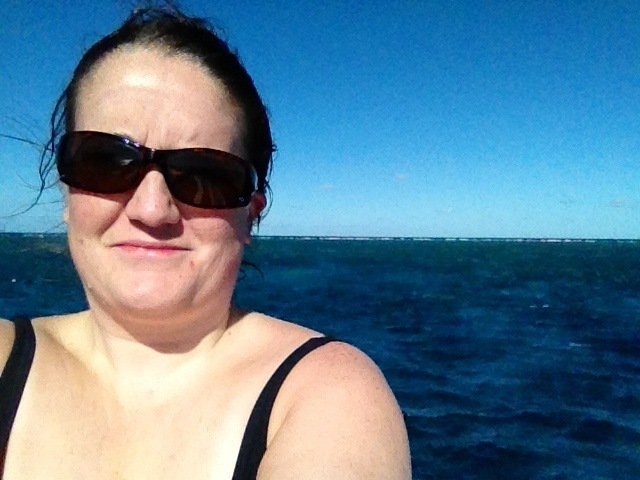 We moved on a little to a different area of the reef for our final snorkelling session. Winky (yes, that was her real name) led anyone who wanted to do a guided snorkel and a few of us headed out with her. Bloody glad I joined in! She showed us some of the different type of coral, the clams – huge thing which she got to shut by pushing the water at it. We saw a Sea Cucumber which was the most random thing. She went down to the bottom to pick it up so that we could touch it. It felt very much like old worn leather. We saw a Nemo!!! Swimming in and around some spaghetti coral – I nearly choked with excitement & as a result managed to take in shed loads of water & even managed the nose trick with it all too! Ouchies! Just before she finished the guided tour we spotted a turtle which was amazing. It looks so like a grumpy old man!! The others that had been following the tour too all sort of dispersed and there was myself and one other girl (not from our group) who turned back a little to go and watch the turtle nibbling away on some food. It was quite some experience I can tell you. I had to control myself at one point as I really thought that I was about to cry in the mask – that would not have been much bloody use. The emotion & reality of what I was doing just welled inside me like an overflowing pot. It was truly breath-taking watching this amazing creature in its natural habitat going about its own business, which included peaking to the surface for air as it does every 20 mins or so. Seeing it underwater as it swam up arm distance from me, so close that I could actually touch it. See it taking its breaths and then heading back on down for food again. 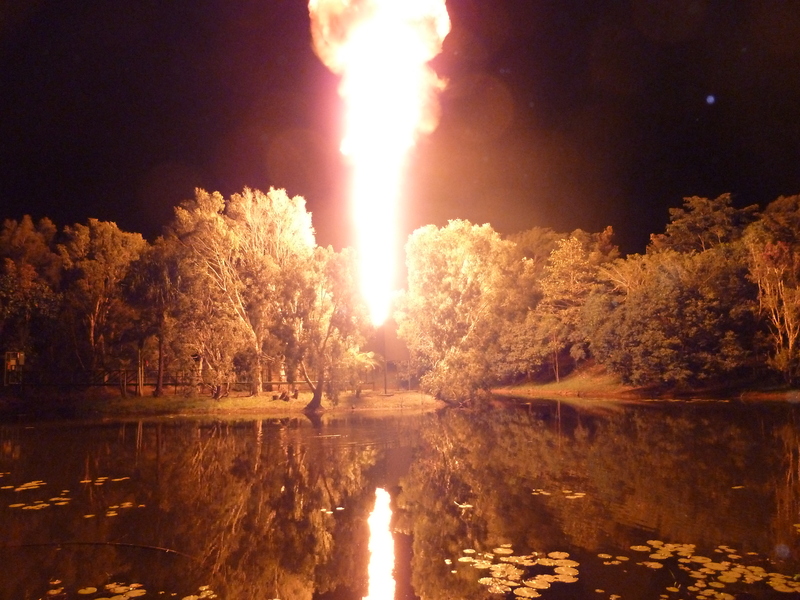 It totally took my breath away. I was happy. Job done. 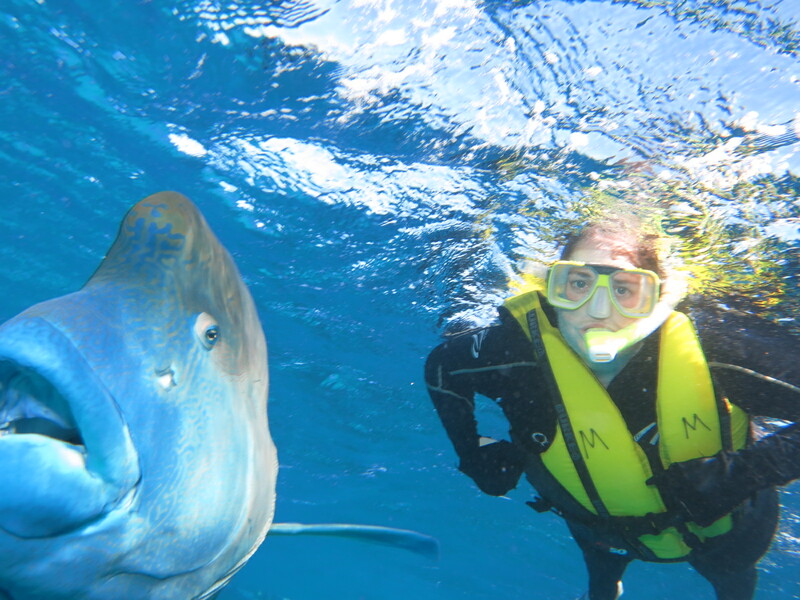 Great Barrier Reef you were all I had imagined, hoped for & dreamed about for years. 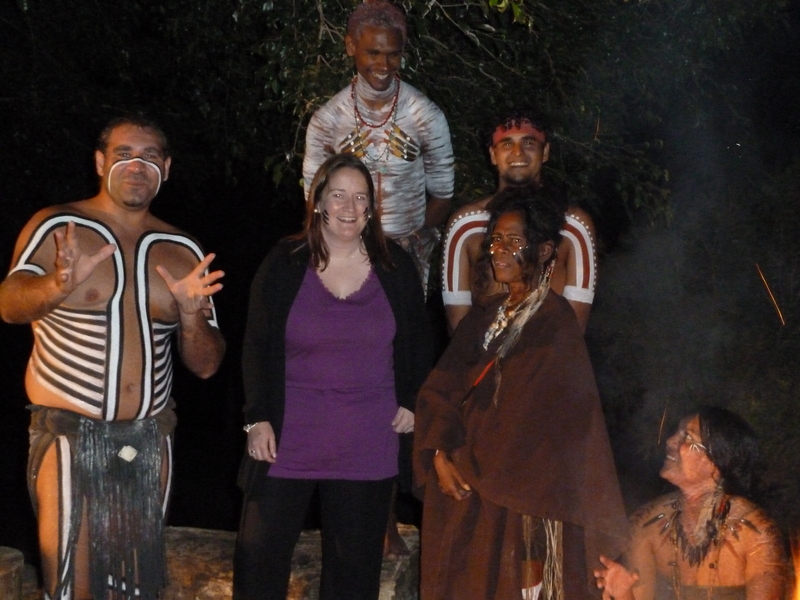 The evening was spent taking onboard some Aboriginal Culture at the Tjapukai Aboriginal Cultural Park where we were having dinner as well. To be honest with the cost of food out here with wine at a meal too – it was possibly only 10 bucks more. Stupid really but there we go. I’ve eaten well, don’t get me wrong but the price of food is WAY higher than I anticipated. It’s relative to the Australians apparently for the wage that they get. I guess that for us in the UK the Aus dollar has gone down against the pound and so it probably wouldn’t have seemed so expensive a few years back. 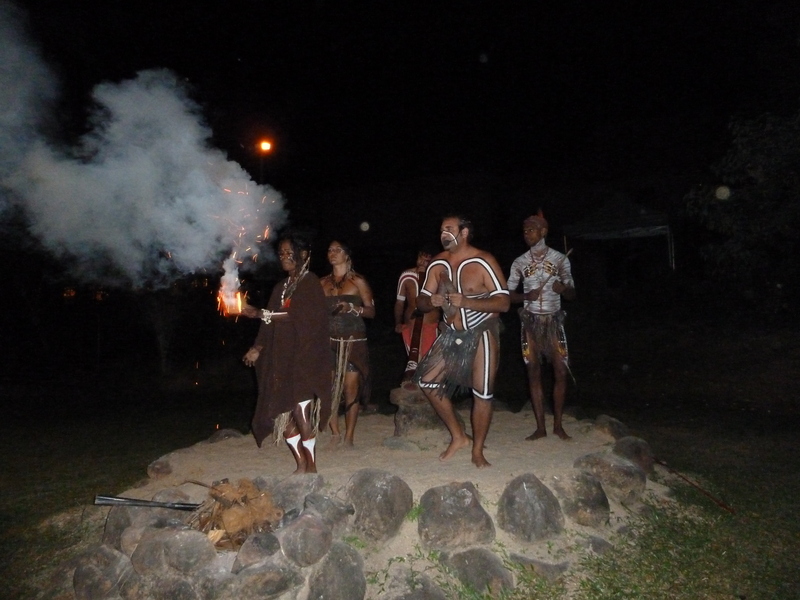 Our evening included the Didgeridoo blessing as well as having our faces painted, listening to Aborigine folk tales as well as watching them make fire from rubbing a stick (no, really). It was dewy underfoot but thankfully not too cold as most of the evening took place outside. 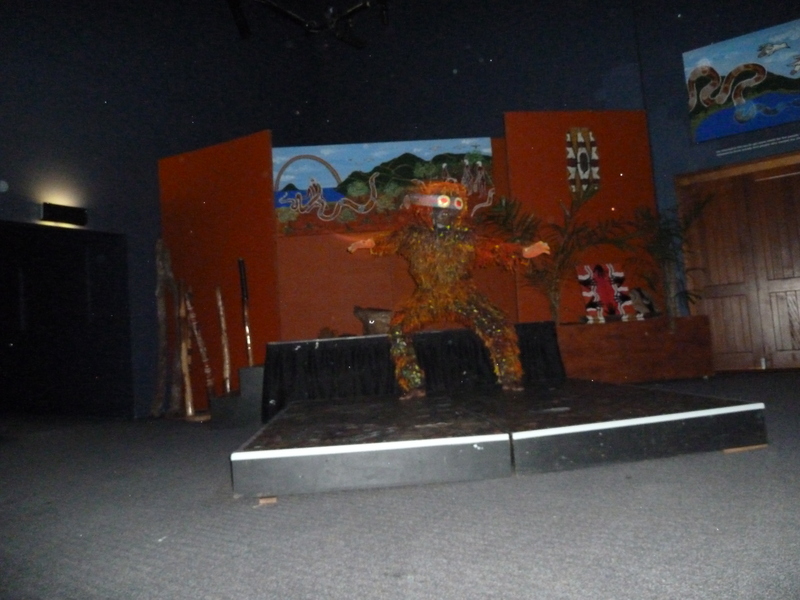 Some Aboriginal tales told with a random dancing monster! 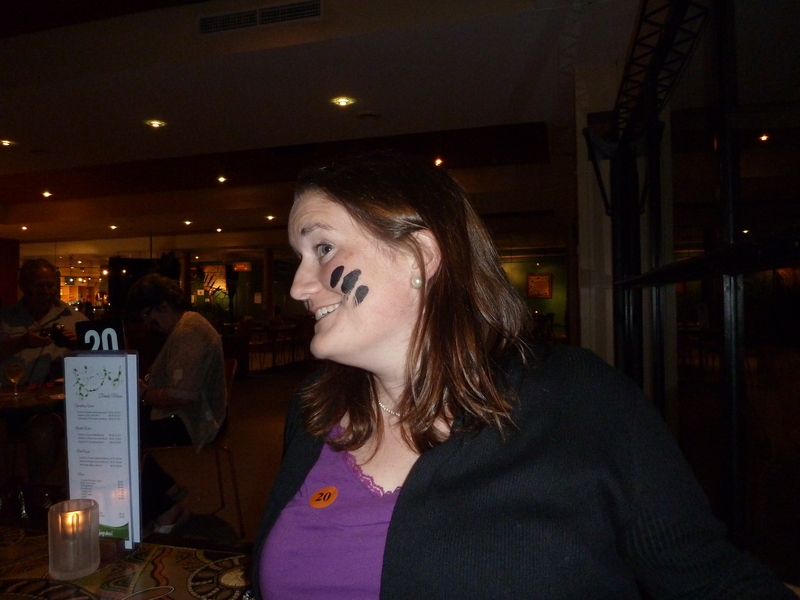 With my face paint on! When it came to coming back inside for the buffet meal there was further entertainment to focus our attention on. More singing and audience participation. There was a distinct lack of audience members wanting to be on stage with them, dancing and such the like. The teacher in me had my hand up straight away, I think much to the shock of those that I was with!! Initially we were on stage (myself & some other chap) helping the dancers to make fire by rubbing a small stick up & down between our hands – taking it in turns with the bottom of the stick staying in place on a wooden ‘fire block’ when you rub the stick up and down – after doing it for a while between the two of us one of the dancers warmed the palms of his hand and did it a couple of times too, obviously much more quickly than either of us! 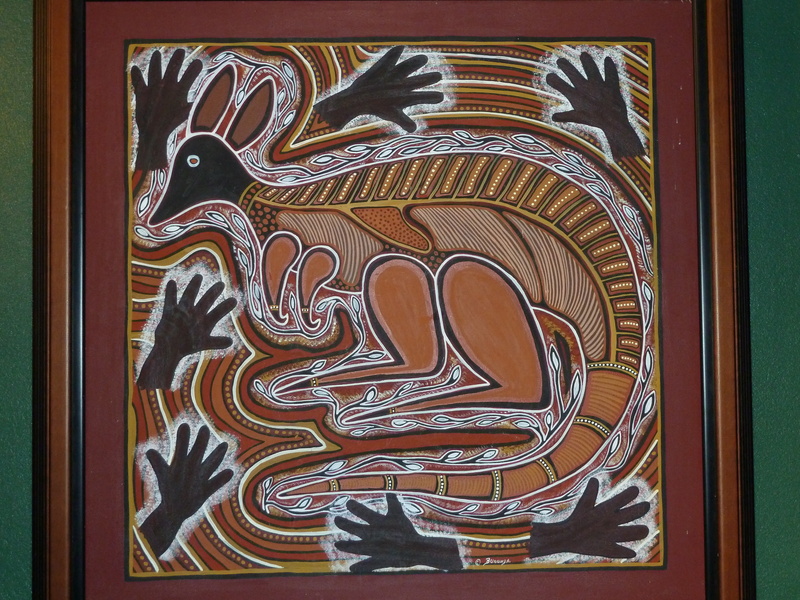 I then took over from him & a speck of lit ash jumped onto the bundle of dry grass. My name is Keith – I am a fire starter, a twisted fire starter!! 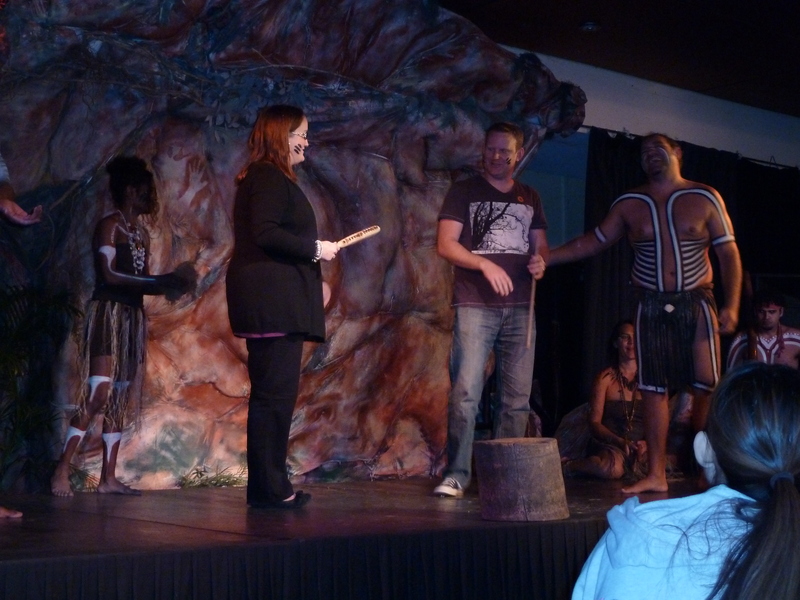 We then had to participate in some form of Aboriginal dancing. 2 left feet Em whose dance moves include the funky chicken & the elbow dance did indeed look like a flaming galah!! It was very sweet of them, for my participation I was given a plain returning boomerang – that saves buying one!! 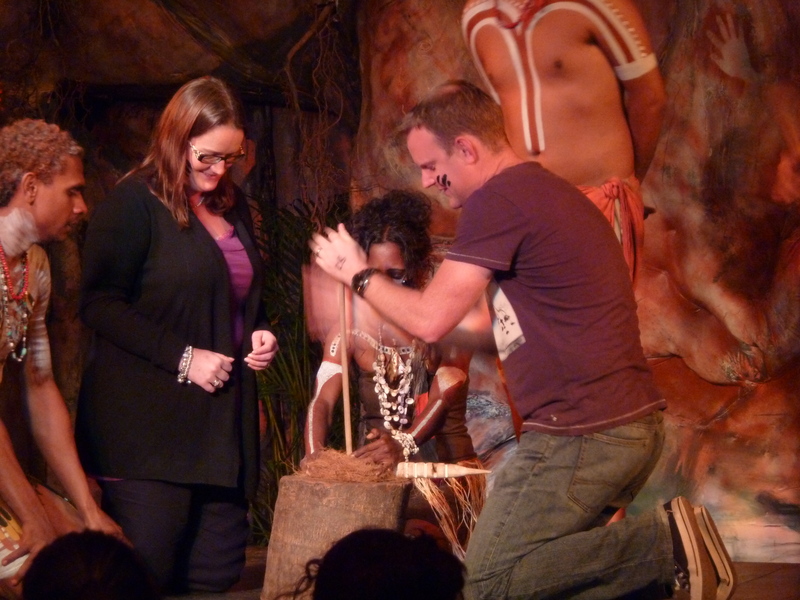 Starting to make fire using a stick which you rub between your palms, yes it was as random as it sounds! Posted on July 1, 2013, in Lions 2013 and tagged British & Irish Lions, clown Fish, Great Barrier Reef, maori wrasse fish, Pacific Ocean, turtles. Bookmark the permalink. Leave a comment.